When the Civil War broke out, James E. Love enlisted as a sergeant in the United States Reserve Corps. He left St. Louis with his fellow Union soldiers on June 15, 1861, and the next day sent the first of 160 letters home to his beloved fiancée, Eliza Mary “Molly” Wilson. 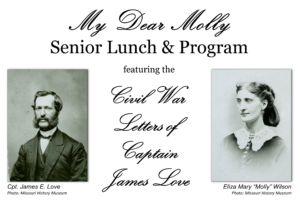 These letters have been published in a book titled My Dear Molly: The Civil War Letters of Captain James Love. Hear excerpts from Love’s letters regarding his Civil War service, and become part of the great love story of two ordinary Americans living in extraordinary times. UH house salad, pumpkin and apple pie, coffee, iced tea, and water. Need a ride? We also offer complimentary cab service! Reserve a cab when making lunch reservations.